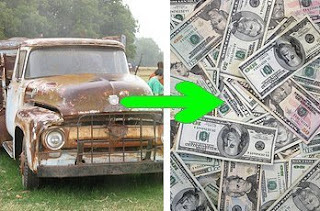 Could you cash in If "cash for clunkers" is implemented? Congress has been considering a "cash for clunkers" program where they would give vouchers for people who trade in older less fuel efficient cars. The goal would be two fold. First it would give a stimulus to get people buying new cars. Second it would remove old fuel efficient cars from use thus lowering our use of foreign oil and helping the environment. My immediate thought about such a system is that people would game it to buy old clunkers for cheap and then trade them in for the vouchers thus profiting off the program. "Drivers would be eligible for reimbursement for purchase of a new or used vehicle with a fuel economy rating that exceeds federal targets for that class of vehicle by at least 25 percent. The vehicle must have a manufacturer suggested retail price of less than $45,000 and be a model year 2004 or later. The vehicles turned in must be drivable, registered in the United States and have a when-new fuel economy rating of less than 18"
"In the first year of the program, a person trading in a vehicle that is model year 2002 and later would be eligible to receive $4,500 for purchase of a new vehicle, $3,000 for purchase of a used vehicle or $3,000 for transit fare credit. For model year vehicles 1999 to 2001, drivers would get $3,000 for the purchase of a new vehicle. Those who trade in vehicles that came out in 1998 or before could get a credit of $2,000 for a new vehicle." I checked Autotrader for my 200 mile radius from my zip code and I didn't find any 2002 or newer vehicles for under $3000 that would qualify. So I don't see any potential to game the system for a used car. If you're looking to buy a new car then you might be able to find a used car to buy to get a voucher. Looking at the 2002 and newer vehicles I found one van for about $3500. That would get you a $4500 credit. There were a handful of cars in the 1998 to 2001 age range that were under $3000. But not by a lot. Once you get down to the 1998 and older cars I did find a few for under $1000 that might be usable to get a $2000 credit. THere are a few cars out there that you could buy and then trade in at a profit. But the profit is not that substantial and seems to max out around $1000 range. Part of it is that the "clunker" car must have relatively low fuel efficiency. Then the only way to profit off the resale of a clunker would be to buy a new fuel efficient car. My conclusion is that there are very few used cars out there selling for low values that would give you a significant profit through this program. Probably more importantly, as soon as a program like "cash for clunkers" went into effect the sale prices of the "clunkers" that qualify would go up as a reaction.